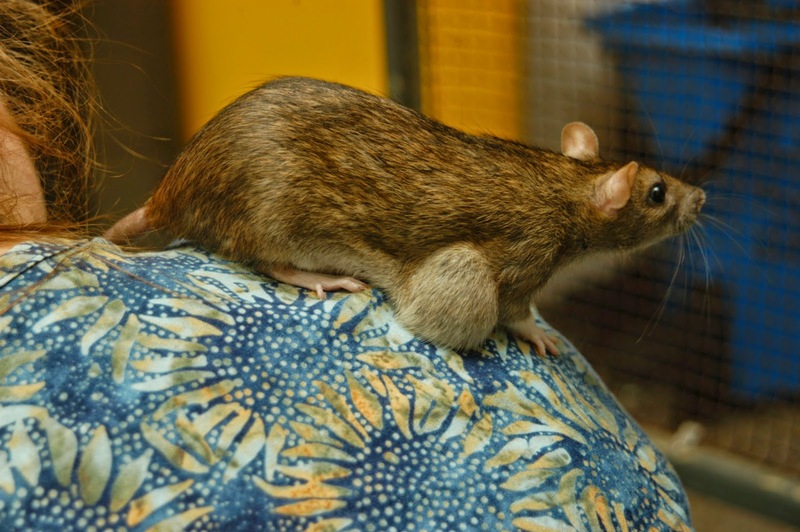 Lump on a rat. Or is it a rat on a lump? Some lumps can grow so big that even if they aren't malignant, they get in the way. This one was removed, freeing up Lilith the rat here to use her forearm again. Have you ever found a lump on your pet? This week I’m running a two part series on lumps in companion animals. What are they? What should you do about them? Can you just ignore them and hope they will go away? It’s very common for an animal to present, either directly for the purposes of examining a lump OR incidentally (e.g. a vaccination, and by the way – is this lump anything to worry about?). Part 1 – What is this lump? I’ve found a lump on my pet. What should I do? Don’t panic. Veterinary patients commonly present with lumps, of which there are many causes. A lump is a collection of cells in the skin (a cutaneous lump), or in tissue beneath the skin. Broadly speaking, lumps can be non-cancerous (for example, an abscess (pus), hematoma (blood) or inflammatory reaction (for example, hives or urticaria), or cancerous (neoplastic). Very occasionally a lump actually contains a foreign body. For example, when I removed a lump from the armpit of a dog, I found it contained part of a kebab stick which had migrated from the gut through the abdominal wall. I have to confess that was a very satisfying lump to remove. 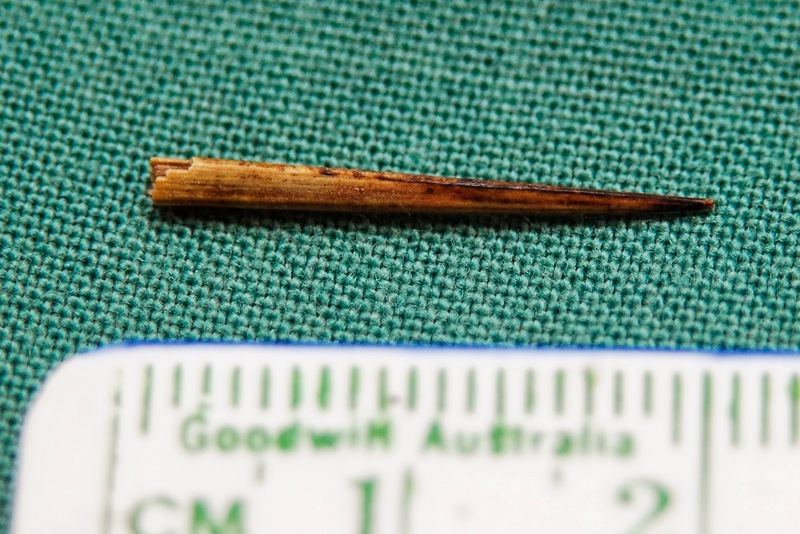 Better out than in: the tip of a kebab stick was found in a lump in the armpit of a dog. Cancerous lumps may be benign or malignant. There is no way to determine if a lump is cancerous just by looking. Cancer is a tissue diagnosis. That means that a biopsy is required to determine whether cancer is present. The good news is that many cancers can be cured with early treatment. Contact your vet and arrange an appointment. Can some lumps go away by themselves? Occasionally, but this is the EXCEPTION rather than the rule. For example, puppies may develop histiocytomas which can disappear. Similarly, warts (or papillomas) may occur (especially in puppies) then disappear over the course of a few months. 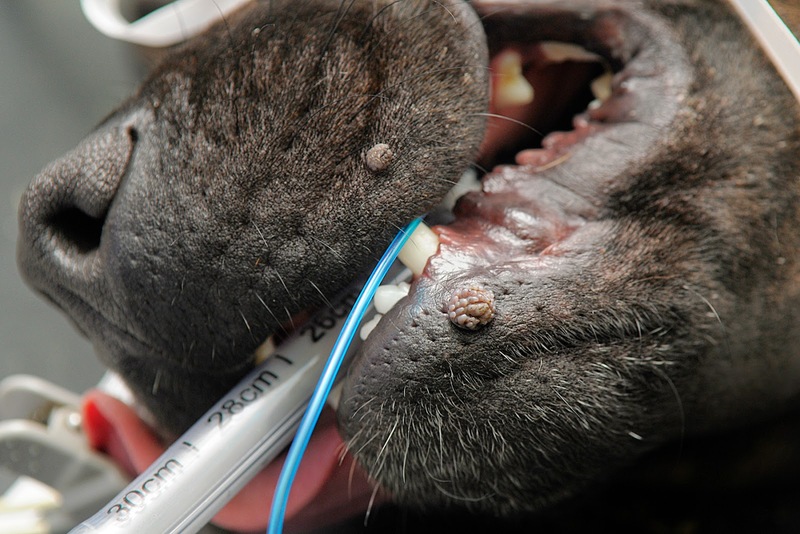 Warts in the mouth of a puppy (this puppy is anaesthetised for desexing). They can be tricky to see when the mouth is pigmented like this, but if you look closely you will see rather a lot. 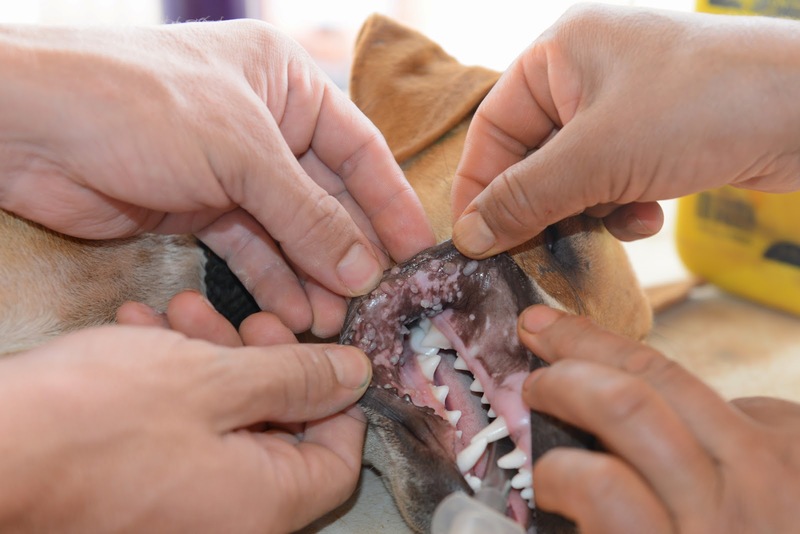 Oral warts are not uncommon in puppies and usually occur in multiples. A close up of a large wart in a dog (the diagnosis was confirmed by histopathology). It’s only a small lump. Should I just keep an eye on it? While it can be tempting to “wait and see” if a lump changes or grows bigger, if the lump is cancerous then there is a real risk that the cancer will progress and may spread to other sites in the body during this waiting period. The earlier a diagnosis is made, the better the outcome. The size of a lump alone cannot be used to determine whether or not it is cancerous. It’s been there for ages. Sure, but that doesn’t mean it isn’t nasty. Cells in a lump can transform into cancerous cells over time. In some cases cancers are slow growing. Being around for months or years doesn’t mean a lump is harmless. 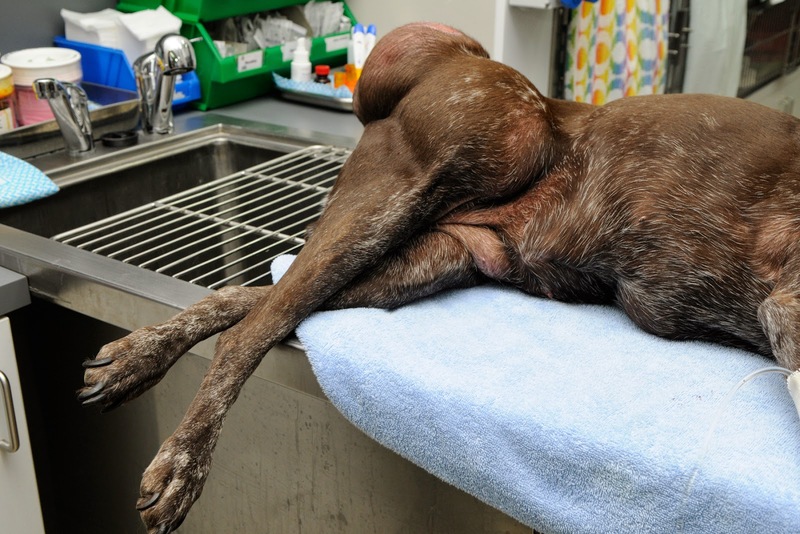 This benign fatty tumour (a lipoma) grew so large that it affected the dog’s movement. Surgery to move very large lumps like this is much more complicated. Can't you tell me if its cancer just by looking at it? In short, no. Cancer is a tissue diagnosis. You need to examine cells or tissue to make a diagnosis of cancer. Sure, if its full of pus its more likely to be an abscess. Even more so if the patient is a cat who has just been bitten by another cat. But lumps can be misleading. Tumours often develop "necrotic centres" and may appear to be abscesses. A malignant mast cell tumour on a dog that has been shaved for surgery. 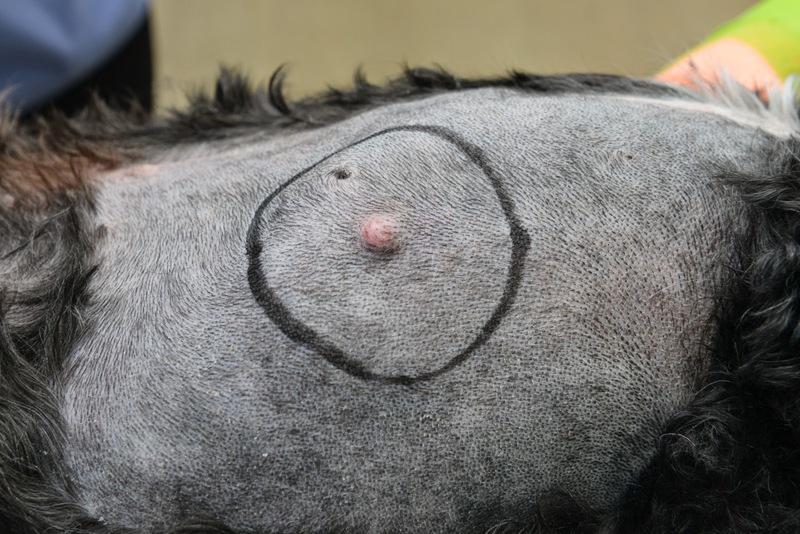 The circle around the lump indicates the extent of margins required to ensure the tumour is removed locally. What does a biopsy involve? There are different biopsy techniques, ranging from a needle biopsy (where cells are removed from the mass for examination on a slide), to incisional biopsy (a piece of the tumour is removed), to excisional biopsy (the entire tumour and a barrier of normal tissue are removed). The type of technique used depends on the location and size of the lump. Where possible, we take a biopsy prior to performing any other surgery. There are exceptions to this rule: for example, where a lump is found in the testes we usually remove both testes by castration (this is an excisional biopsy). Sometimes the result will suggest that surgery is not required. For example, in the case of small fatty deposits or cysts, surgery may not be required. Alternatively, in the case of some cancers like lymphoma, medical rather than surgical treatment is used most commonly (with rare exceptions). Why do you recommend sending biopsies for histopathology? Because cancer is a tissue diagnosis. The most accurate information about whether something is a tumour or not, or what type of tumour it is, is gleaned from histopathology in most cases. The pathologist can look at the cells within the tissue architecture they are invading, and in most cases can identify what is going on – what sort of disease is present, what cells are involved, how aggressive is it (tumours can be graded). From this information decisions can be made about how big surgical margins should be to give the best chance of eliminating the disease. There is a tendency for some clients to see histopathology as an optional extra. In fact it provides valuable information. Removing a lump without doing histopathology is, in some ways, like taking an x-ray and not looking at it. If I perform a biopsy on any of my animals (and yes, I have done so) it goes for histopathology. I want to know what I am treating. Tune in tomorrow when we talk about treatment of lumps.